I am always trying different things...my dad and husband say I stay awake at night thinking of new projects. And they are right. I really do. 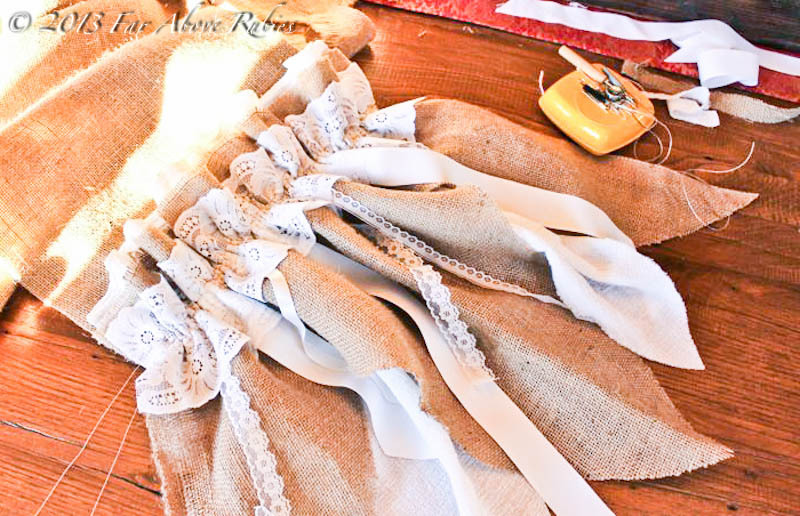 I wanted to make a burlap runner different from most that I have seen, so I decided to give this one a little fairy tale flare. I was specifically thinking of a heroine in rags, like Cinderella. 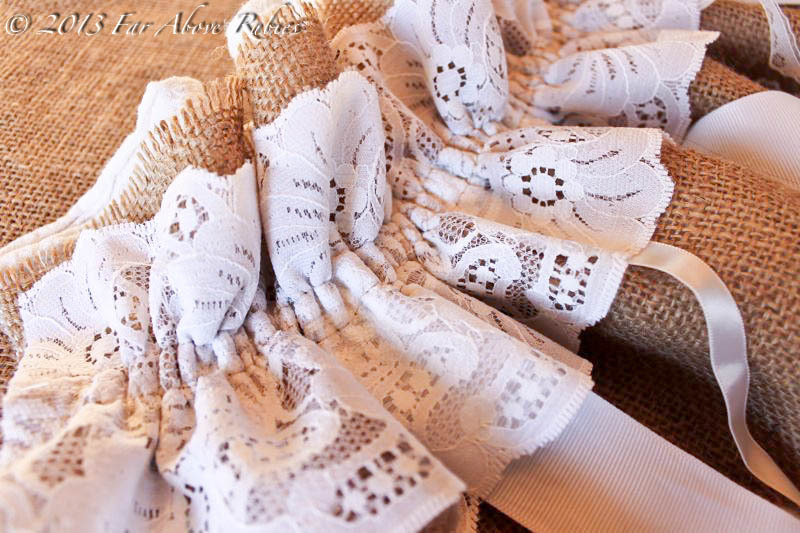 I used lace, ribbons crinkled cotton and all raw edges. 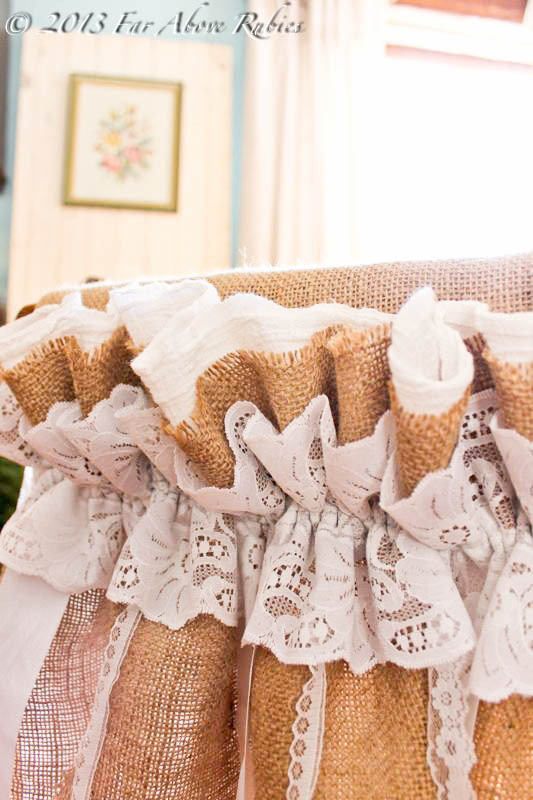 After cutting the length and width of the runner, 71" long and 19" wide, I decided what shape I wanted the end ruffles to be and settled on an alternated diamond-shape. I folded the fabric in half and cut the burlap, then folded the crinkle cotton fabric and cut those points to fit in the center of the burlap points. I then cut lace the width of the ruffle and cut different lengths of ribbon and lace and placed them randomly. 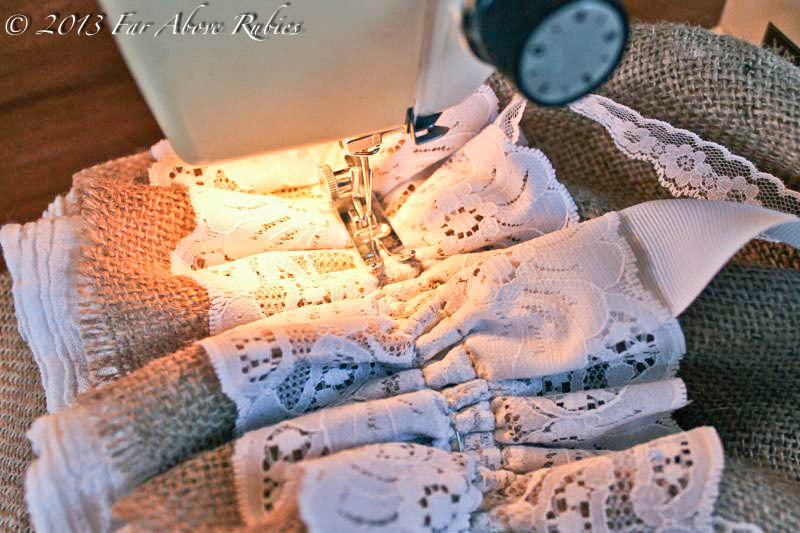 I then pinned them underneath the lace so they would not show when attached. 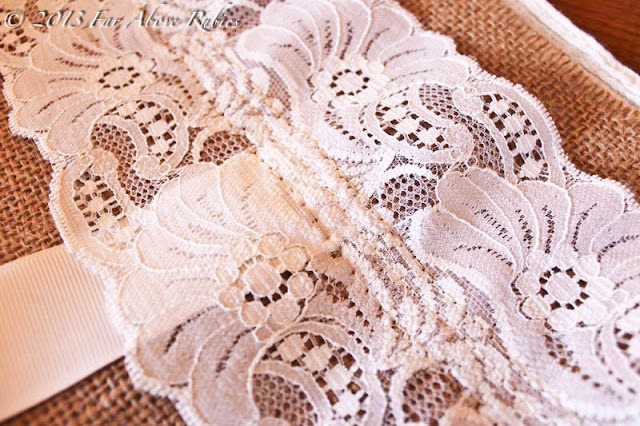 I then sewed a straight line through the middle of the lace to attach all the layers together. Once all the layers were attached, I sewed two gathering stitches evenly spaced on either side of the first stitch. Because these layers are really thick all together, I used a heavier weight quilting thread so it would not break when I pulled for gathering. These two stitches must be as large and loose as you can set on your machine. If they are too tight and small, you will not be able to pull the threads through to make gathers. Then I took the bobbin threads (bottom stitches) on either side of the center stitch and carefully pulled them to the width of the runner. This is what makes perfectly even gathers. 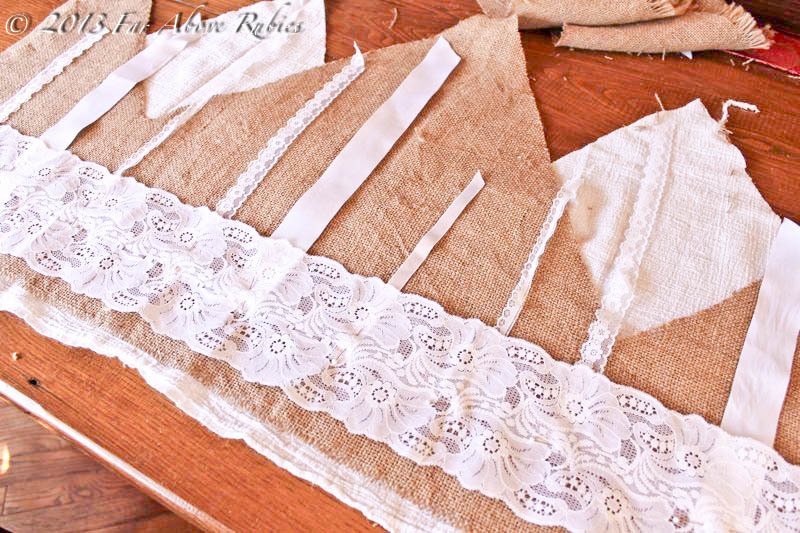 I then sewed over the middle seam attaching the ruffle to the right side of the runner. After attaching the ruffle to the runner, I pulled the gathering stitches out so there is only the one seam attaching everything together. If you continue pulling the bottom thread, they will come out pretty easily. As you can see, there is only one line of stitching. This is one I actually custom made for a wedding, and I also have one made with cream-colored muslin that I used this winter. It really is not that hard if you know how to properly gather, and so cute when finished. This would be great on a large buffet table for a wedding or shower also. I'll be here lying awake thinking of something else fun to make. You are so danged clever - I just love seeing in finished mode those wonderful crafts that keep you up at night. And though I cannot wait for the next one, I DO wish you a dreamless, deep resting sleep tonight. 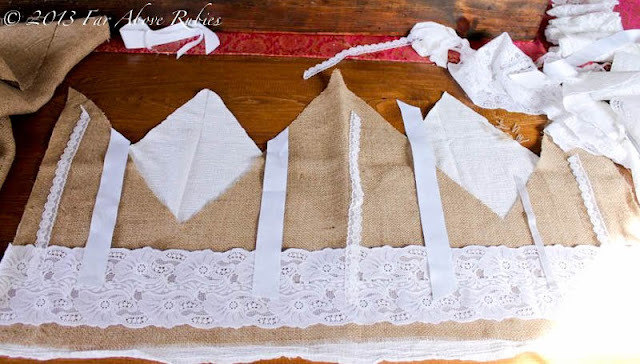 This is one of the best burlap runners out there- well done, ma'am! Very clever and cute!!! Thanks for sharing how you made this with us. I am pinning it from the Blitz Pinterest party over at Debbie and Ann's blogs. I love it and it looks so pretty. It is gorgeous and I can't wait to see the tablescape that you set using your new creation. Very nice Anita. 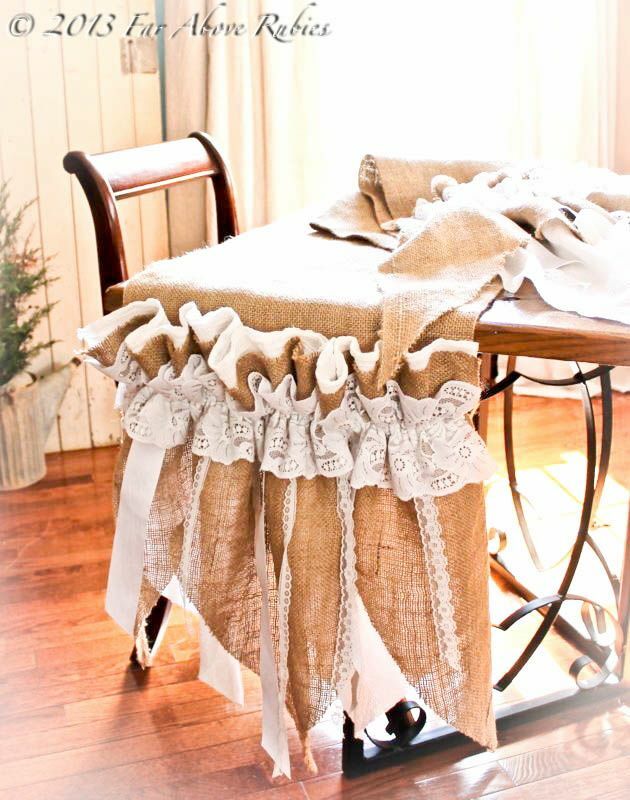 The burlap runner looks so pretty on your buffet. Just elegant and gorgeous Anita, you are so talented and gifted. I always love your mix of rustic, homespun with elegant refinement. This runner is timeless and stunning, season-less. Thanks for the guide and post. This is really beautiful! Found you linked up at Cedar Hill Ranch! I am so in love with this runner. Your "dreaming up projects" time certainly isn't wasted! Sharing this on my Once Upon a Firefly FB page. That is so pretty, the lace and burlap work so beautifully together. 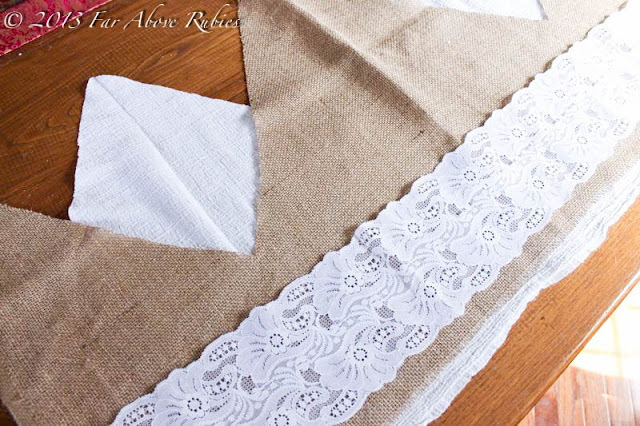 Love your burlap trimmed runner. 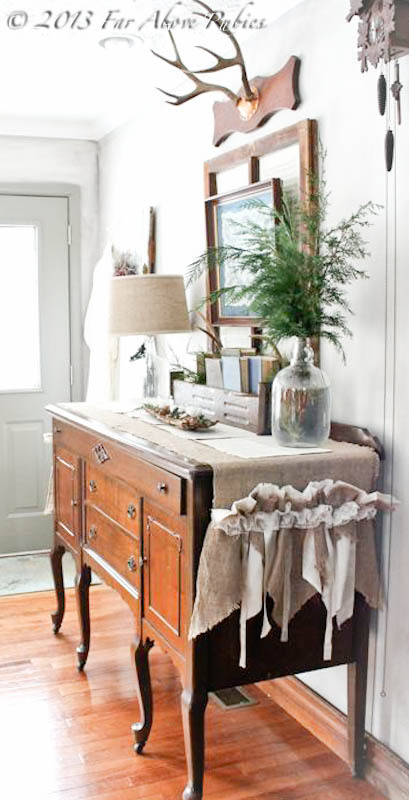 It looks so pretty on the dresser in your entry. Please come by and see the burlap trimmed table cover I made for our dining room! Your runner turned out just beautiful! The 'Cinderella' look is a wonderful way of describing it, with the burlap and lace combination. Your runner is a work of art, so creative! Would love for you to share at Simple & Sweet Fridays. New Follower! This looks so pretty! 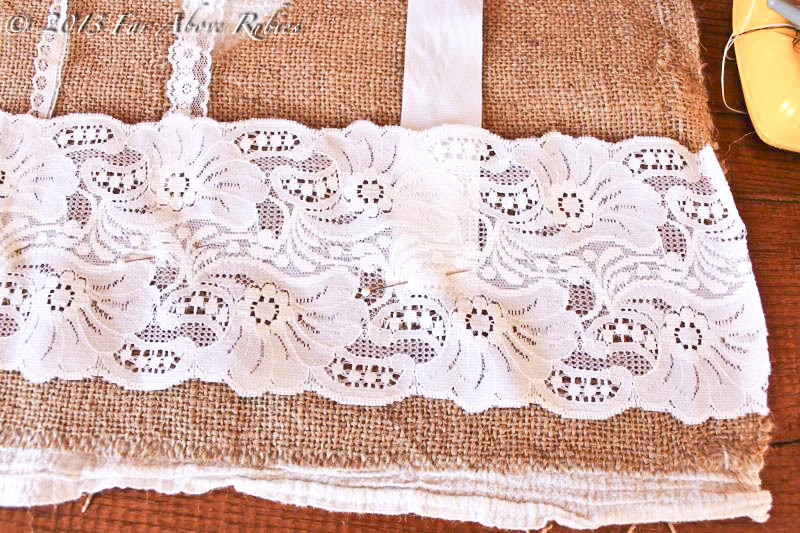 I love the contrast of the lace with the burlap. It looks gorgeous on the buffet! We'd love to have you share it at WIW. Absolutely lovely! This gives me a great idea for my craft booth table. Thank you for sharing! I absolutely love it! It is special and different from others I have seen, for sure. I am pinning this beauty on my burlap page! Very sweet, this would look great i a friend of mines house.. what a lovely gift it would make!